Wolves can reveal the home and away kits to be worn for the club’s return to the Premier League in 2018/19 – the first produced by global sportswear giant adidas. A return to the club’s traditional old gold and black home strip is accompanied by a modern white and black away kit, both displaying adidas’s iconic three stripes. 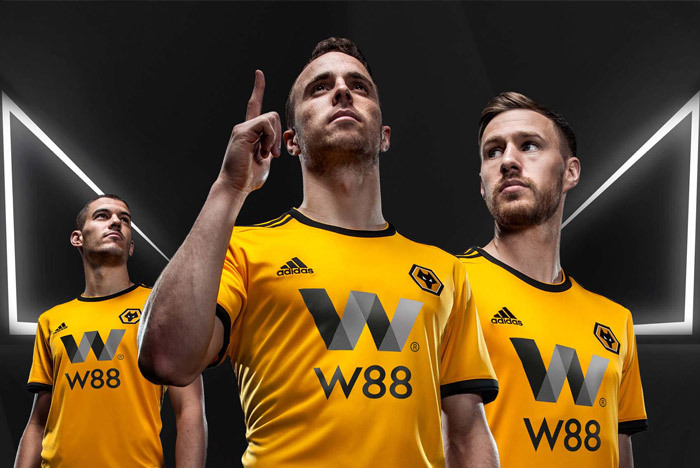 Supporters are able to view a gallery of Wolves players modelling the two new strips, sponsored by W88 here: Old Gold, New Challenge. Junior shirts will be sponsored by Silverbug. Want to share your thoughts on the new kit? Supporters can feature on the microsite by using #OldGoldNewChallenge on Instagram and Twitter. The home kit and the away kit will go on sale in the Molineux Megastore on Friday, 6th July and Thursday, 12th July respectively, but they will be available for pre-order online from 1pm today. Premier League sleeve patches, letters and numbers will also be available to purchase with your shirt. Unfortunately, due to a manufacturing issue – which has affected a number of adidas clubs – infant kit won’t be available until September. We fully understand the frustration that this will cause, and assure supporters that every avenue was explored to deliver infant kit on-time. adidas have offered supporters their apologies for any inconvenience caused. This issue specifically affects kits that fit children aged 6 and under.